Death has always scared me. I have never quite known how to talk about it and I’m always fascinated by those who can. While the questions of what happens after death are things I can discuss and debate, it’s the act of dying and mourning the deceased that just stop me in my tracks. Latin cultures, on the other hand, are something that I love. From the food and music to the warmth and vibrancy of the people (not to mention the fact that I’m going to marry a Brazilian) - I relish in opportunities to learn and be immersed in Latin American traditions. The first time I went to Mexico, I did what all good tourists do - I visited souvenir shops. I was overwhelmed by so many beautiful things. I remember going to the section of the store that held the calacas. I was intrigued but also scared. It was about death. I couldn’t wrap my head around how death could be celebrated. I came home with a huge truckload of goodies, but only a very small set of Dia de los Muertos mariachi figurines. I didn’t totally connect with them but I didn’t want to be afraid either so the purchasing these 2 inch figurines made me feel brave and accepting even though I still really had no idea how people could dedicate so much time to making elaborate figurines, alters and shadow boxes, filled with vibrant colors and joy when their loved one was gone. Enter 2017. I’m starting to get it now. Halloween has always been my favorite holiday. And I’ve known for years that Dia de los Muertos follows immediately afterwards. As Halloween approached this year, I found myself more curious and interested in celebrating and recognizing Dia de los Muertos. I spent a fair amount of time online reading and looking at all of the wonderful works of art created to celebrate loved ones. 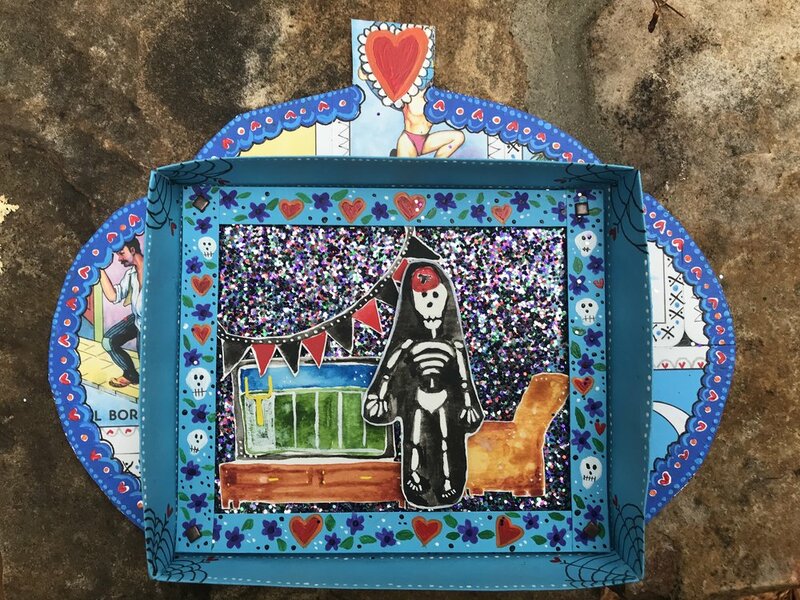 A picture of my own little nicho (shadowbox) started to emerge - one that celebrated my brother and one his most favorite things - football. Mi hermano vive. Mixed media, 2017. My hope was to have this completed by November 1, but life has other plans for me. I also had a hard time with some of the details. I reworked a few areas which was stressful, as I just wanted it to be a happy, easy project that celebrated my brother. I got frustrated along the way, and at one point I just wanted to stop. I kept going though and while I still think it’s lacking something, this is where it is right now. I might tinker with it a little more, I’m not sure. Art teaches me so much. Patience is one of its biggest lessons. Another lesson that I’m so often reminded of is that things don’t always go according to plan, but if I just keep going it all works out - usually surpassing my expectations. There is also always an opportunity to learn. Over the past month, I’ve really taken this to heart. Some lessons are easy. Some are exciting and I dive head first into them. Others are painful, scary and hard and are not things I would ever willingly enter into. But here I am - learning, trying new things and embracing things that used to scare me. Instead of fear, I’ve found love and bittersweet moments of joy.